so today, as ever with some trepidation it was off to The Royal Gwent for a Flexible Cystoscopy – this time was in the urology center where they have larger and clearer HD VDU screens. The increased high definition showed up many of the scars from previous resections and clearly showed the resection of New Year’s Eve, once the position of the ureter stump was found (stump of course as mine was removed when I had my left kidney removed in 2001). 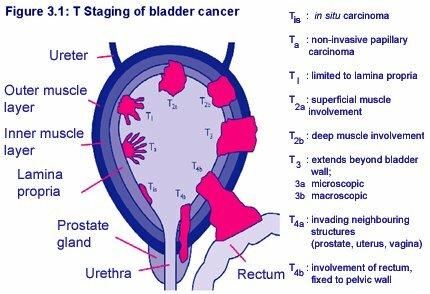 The site of that resection, which had started out as a T3, was looking very healthy and similar to the surrounding wall of the bladder, which was very reassuring. I’m not sure who was most surprised at just how clear my bladder was so scarring not withstanding it was an all clear. I do have a feeling that if I entered the middle lobe of my prostate in a competition it might just win at least a placing that size! However as yet it is no serious problem and with all the future flexis the opportunity is there to check it every 6 months or so. Then a visit to the urology unit where I have now been a patiet for 13 years!!!! Many changes of staff as a number of the original staff have now retired but the genuine interest and humour of those who have watched my progress and helped to keep me alive is a huge encouragement when you consider around 6,500 people a year are diagnosed with Kidney Cancer with a morbidity rate of around 5,000+ within the 5 years that classify as cured if you can last past the 5 years! The Morbidity Rate is not as encouraging as one might wish! 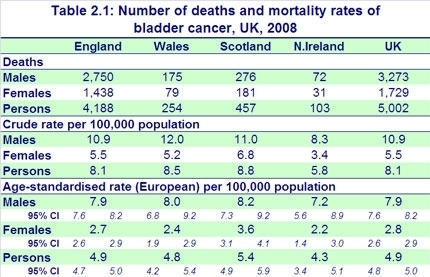 The number of bladder cancer deaths and mortality rates for the constituent countries in the UK are shown. So I guess on this alone my survival is unusual and then considering the TCC Tumours in the abdomen and the cancerous Lymph Node(s) the stats have been against me with chemo and Radio Therapy – I have been incredibly fortunate! I also note that Robin Page, a friend of mine with prostate cancer who you may know from his days on ‘One Man & His Dog’, his oncologist who is in her 40s ignored a pain in her lower back and is now facing serious spread opf cancer which is now being treated but with a poor prognosis I understand. We all know all too many who are facing the challenges of cancer and I hope they will find they have the good fortune I have had and the team that has supported my fight against this pernicious collection of diseases! ANYONE wanting help or a chat – an amateur view from someone who has been there, got the TShirt and been subject of the video do feel free to contact me if you feel I might be able to informally help! This entry was posted in Bladder cancer, Cancer, FLEXI, Flexible Cystcospocy, Royal Gwent. Bookmark the permalink.